45-Piece Pet First Aid Kit for Dogs and Cats - Everything You Need to Take Care of Your Pet! As a pet owner, you have a responsibility to make sure you do everything you can to take care of your cat or dog. But, if you don't have a pet first aid bag on hand, then you could be caught off guard in the case of emergency. Our Certified Pet Friendly pet first aid kit is designed to help you have the tools and equipment you need to handle accidents and injuries before you're able to get your animal to the veterinarian. Be an awesome first responder for your furry friend! - 3 gauze pads 3" x 3"
HELP YOUR PETS WHEN THEY NEED YOU by carrying a first aid kit for pets with you wherever you go. Immediately attend to injuries until they can be seen by your veterinarian. FDA APPROVED - 45 PIECE FIRST AID PET KIT gives you everything you need including bandages, gauze, gloves, antiseptic and more. Our kit is Certified Pet Friendly! This kit can also be used for human injuries and immediate first aid. INSTRUCTIONS AND GUIDE BOOK INCLUDED so that you know what to do in case of an emergency or accident with your cat or dog. KEEP EQUIPMENT AND SUPPLIES ORGANIZED in a pet first aid bag so that you can find what you need quickly. Clear vinyl pockets allow you to see tools instantly. 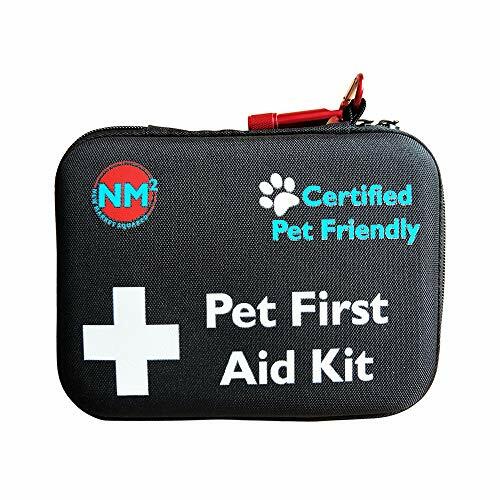 PET FIRST AID KIT - PERFECT FOR TRAVEL take it anywhere you go, also keep one in your home so that you're never without the supplies you need to take care of your animal friend. Click "Add to Cart" now! If you have any questions about this product by New Market Squared, contact us by completing and submitting the form below. If you are looking for a specif part number, please include it with your message.